A light and airy sugar free cheesecake keto mousse recipe that’s quick and easy to prepare. 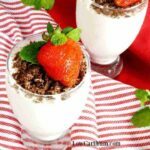 This low carb dessert is great with chocolate or fruit sauce. You can probably tell from my previous recipes that I like mousse. 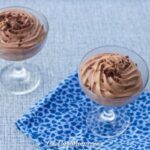 Some of the low carb mousse recipes I’ve posted include chocolate mousse, dark chocolate mousse, key lime mousse, raspberry mousse, and peanut butter mousse. 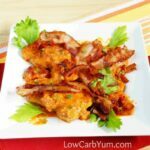 Now I’ve got another great recipe to share with all you low carb fans. Sugar free cheesecake keto mousse! This is a super yummy dessert that whips up quickly. 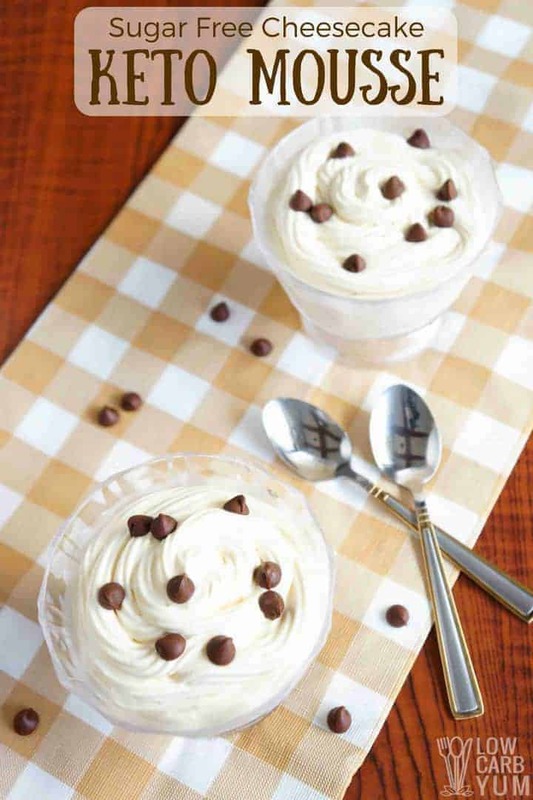 If you like the taste of cheesecake, you are going to love the flavor of this mousse. 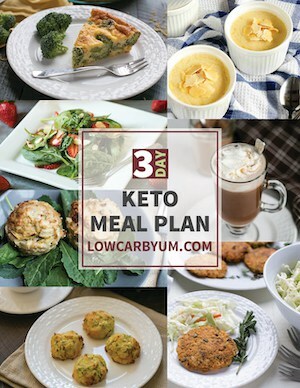 And the best part is that it’s one of the quickest low carb desserts you can make. 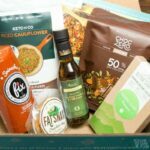 Plus it only uses only six ingredients that you likely already have. For this recipe, you start by putting a block of cream cheese in a mixing bowl. 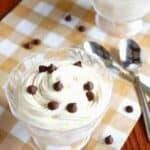 (photo 1) For this sugar free cheesecake keto mousse, I use it right out of the refrigerator. To soften the cheese, I put it in the microwave for about 30 seconds and then stir it up with a fork. (photo 2) It’s important to start with softened cream cheese, otherwise you could end up with lumps. At this point, it’s time to add sweetener and flavor extracts. (photos 3 & 4) I love using a mix of erythritol and stevia along with stevia extract powder. But feel free to use the sweetener(s) of your choice. You can always taste test to get the amount right of sweetener. The recipe needs about 1/2 to 3/4 of sugar replacement depending on how sweet you like it. For the extracts, I use vanilla and lemon. However, feel free to experiment with different ones to change up the taste. The sweetened cream cheese mix is excellent by itself before adding the whipped cream. However, to get the airy texture, you’ll want to incorporated the cream by folding it in first (photo 5) which prevents too much deflation. Then the entire mixture is whipped together (photo 6) with an electric mixer. You can pipe or spoon the mousse into individual serving dishes right away or do it after the mousse has chilled in the refrigerator. I prefer chilling first and then putting into serving dishes. Using a pastry bag to pipe the mousse into single servings gives a pretty look, but scooping out with a spoon is fine as well. I see real possibilities with this recipe. 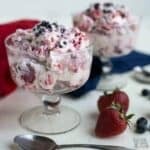 You could dress this one up with some sweet cinnamon almond meal sprinkles to mimic graham cracker crumbs and add some drizzled strawberry sauce for a strawberry cheesecake parfait. 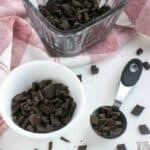 Maybe you want to put some chocolate shavings on top of the sugar free cheesecake keto mousse. Or maybe you prefer a low carb fruit sauce. 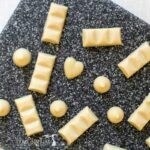 For a quick topping, I sprinkled sugar free chocolate chips on each serving. Another option would be to double the recipe and use it as a light and airy no-bake cheesecake filling. You can even blend it with another low carb mousse like this strawberry one from Low Carb Maven! 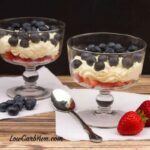 I enjoyed this low carb cheesecake mousse so much that I’m already planning to make it again. But I may change up the flavors next time. A chocolate or berry cheesecake flavor would surely be tasty. There’s practically endless possibilities with this simple keto dessert with heavy whipping cream and cream cheese. 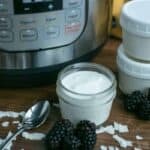 Enjoy this keto friendly cheesecake mousse! If you give this recipe a try, let us know what you think in the comment below. 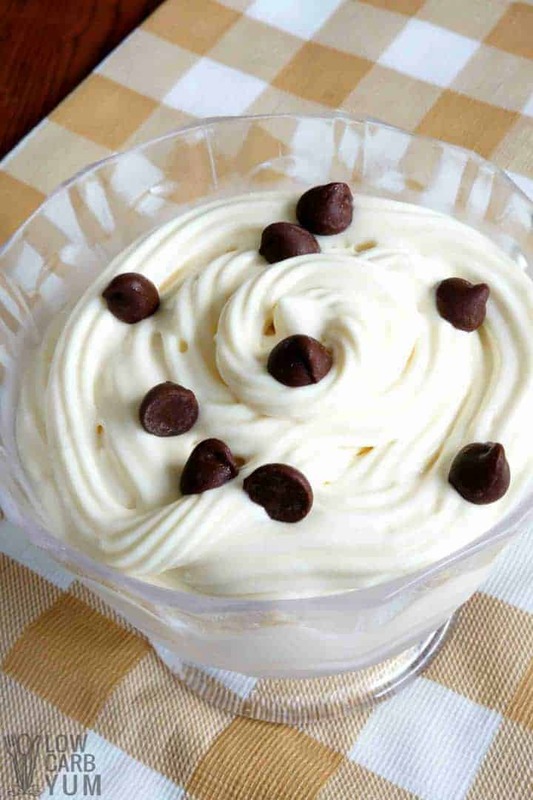 A light and airy mousse recipe that is quick and easy to prepare. 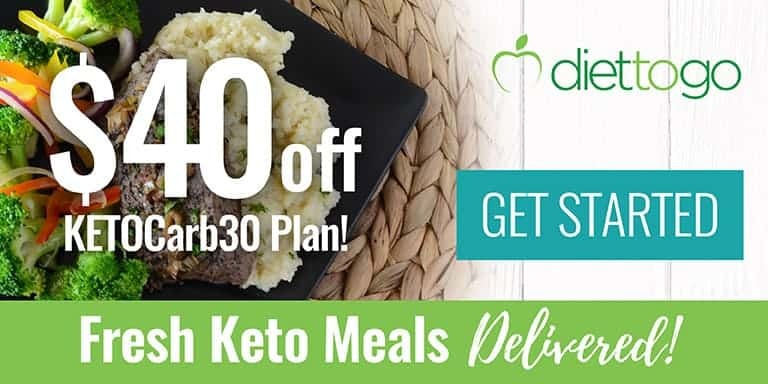 This low carb keto dessert tastes great with chocolate or fruit sauce. 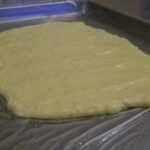 Mix in erythritol, stevia, vanilla, and lemon extract until well combined. 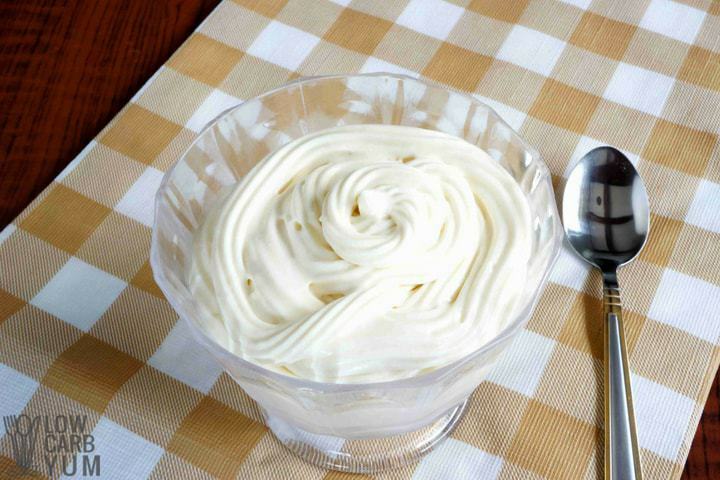 Fold half of the whipped cream into cream cheese mixture until well incorporated. Fold in the other half of the whipped cream. Refrigerate for at least two hours. Pipe or spoon into individual serving dishes. Top with fresh fruit or sugar-free chocolate, if desired. The recipe can be doubled to use as a pie filling. If replacing powdered erythritol with a regular powdered sweetener, omit the stevia or cut back on the sweeteners. 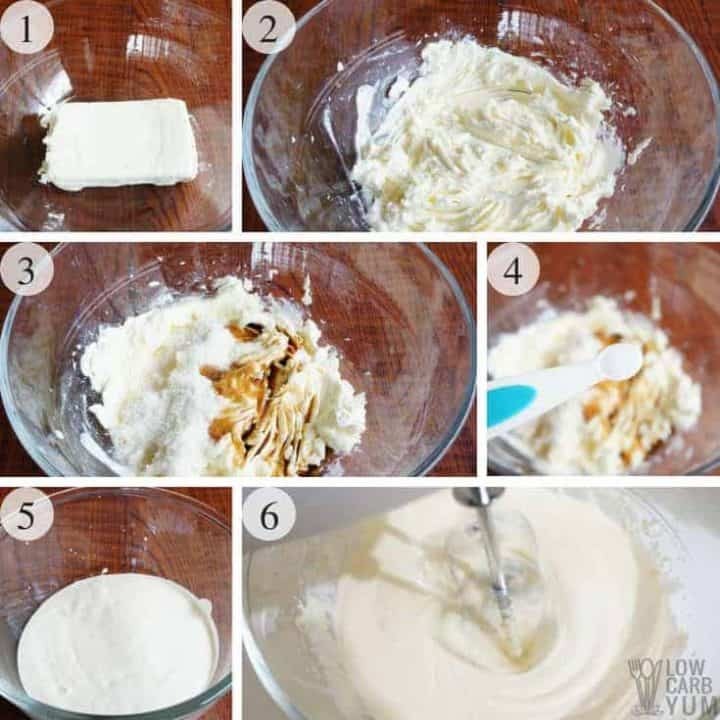 It's not essential to fold the whipped cream into the cream cheese mixture. It can be added and then whipped in with an electric mixture.